RescueOne Connector boats powered by Yamaha high power 60hp jet drive engine - no external propeller to endanger persons/casualties in the water; a four stroke engine with all the environmental benefits as befitting an engine developed and supported by a strategic manufacturer. 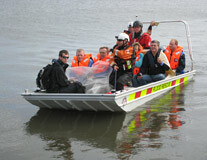 Focused on a mission to provide you with the safest and most effective inland-water, emergency-response boats possible. 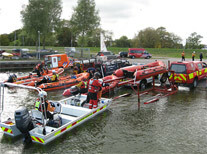 Lightweight boats that CONNECT— the QuikFIT patented railing system provides instant interoperability with mutual response agencies creating enhanced national and regional coordination possible – an enhanced risk assessed safety for the casualties and rescue operatives. With the ability to work in very shallow flood water without compromise. RescueOne boats are considered especially appropriate for resolving major flood event incidents in Phases 2 and 3; since most rescues occur during these phases, this is when rescuers will be at their greatest risk. 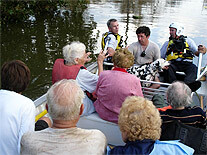 The ‘National Risk Register of Civil Emergencies, 2010’ indentifies that Floods (second only to pandemic illness as the major national threat) are a growing problem. In the escalating phase floods will be impacting the built environment and property which effectively means you are losing egress and access particularly highways – you need a boat capable of urban operations and ease of launch. This vessel is swift, capable and a major asset to assist with resolving inland and sea inundation floods because of its fast mission cycle, stable high load carrying capability and connectability with capability of helo-aquatic integration. Instruments in addition to the engine management gauge; e.g. lights (LED), flood light (& red filter), searchlight(s), Depth Sounder, electronic Fuel gauge / gauges, Global Positioning Receiver (GPS) and boat navigation Compass. Craft can be supplied with: ‘position lights, flashing blue light (LED) as per the IRPC regulations, public address system and wailer, low-level deck lighting around console and demountable hand operated spotlight (‘A’ frame mounts). Four clevis points for lifting. Craft cover (generally made from a 150Denier woven textile, proofed with a synthetic impervious finish). 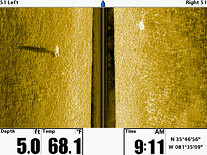 Sonar 'rescue' packages (see image right), can be supplied complete. These devices can be used to aid the rescue and recovery of sub-surface casualties. 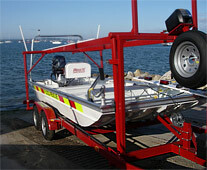 Craft can be supplied with one each specially designed and fitted single braked boat trailer for storage and road transport constructed to current EU road regulations with a single axle, for each boat, with a removable road lights bar, a robust wheel case, low maintenance sealed wheel hubs and 50mm ball tow hitch with jockey wheel. A hand operated winch; with fabric strops and metal hook and a ‘case lock’ or other suitable security anti-theft device. 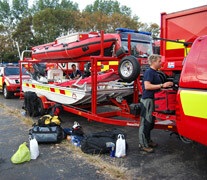 Or alternatively each craft or pair of craft can be supplied with a Double Stack Transport Trailer whose technical specifications are similar to the single but with an electric winch for the upper deck, are designed to transport 2 Rescue ONE Connector Boats (or an IRB or board etc.) 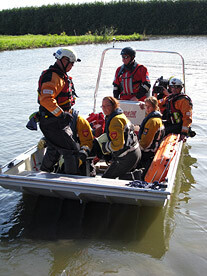 and can also be modified by us for personal watercraft, inflatable rescue boats and Rescue Boards or equipment if the second R1 boat is not required immediately – to provide a Water Rescue Tool Kit. This option gives a vital speed of response and highly desirable flexibility for responders in saving life. Note: the Transport Trailers and technical specifications may be subject to developmental change without notice and the photographs used are for illustrative purposes only as the final specification will dictate the final outcomes. 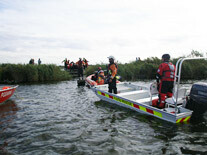 To view a PowerPoint presentation on the RescueOne Connector Boat - click here to download.